A new development proposal at 53-57 Flinders Street Surry Hills by MHN Design Union lodged to City of Sydney in July details a six storey shop-top housing development, retaining the existing retail use on the ground floor, and providing 11 upper level residential units from levels one to five at an estimated cost of over $4 million. If approved, the development will comprise a basement level for bicycle parking and a rooftop terrace communal open space. 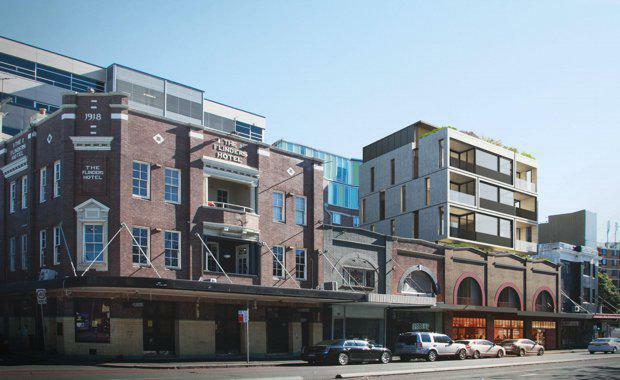 The proposal will retain and refurbish the existing front facades of the terraces fronting Flinders Street, to enhance the relationship and preserve the heritage significance of the terrace group. 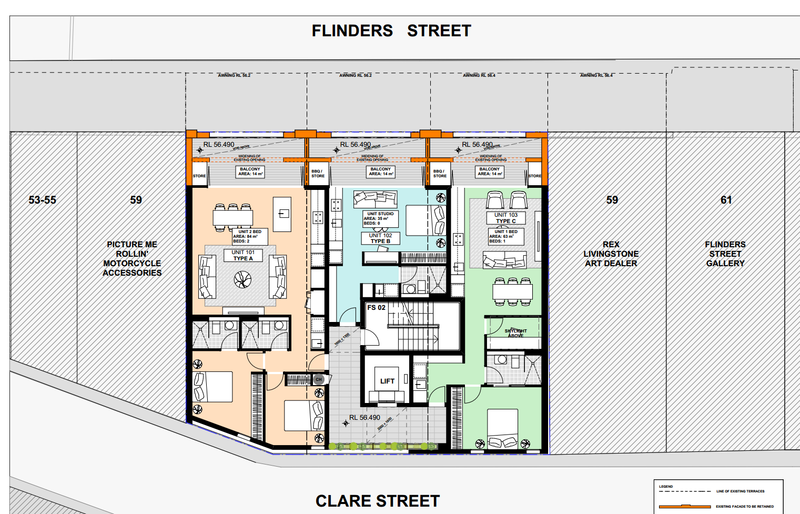 The commercial tenancies at the ground floor will result in the building having an active street frontage and will maintain the commercial character of the site, according to documents lodged with council. Level 1 podium floor plan. 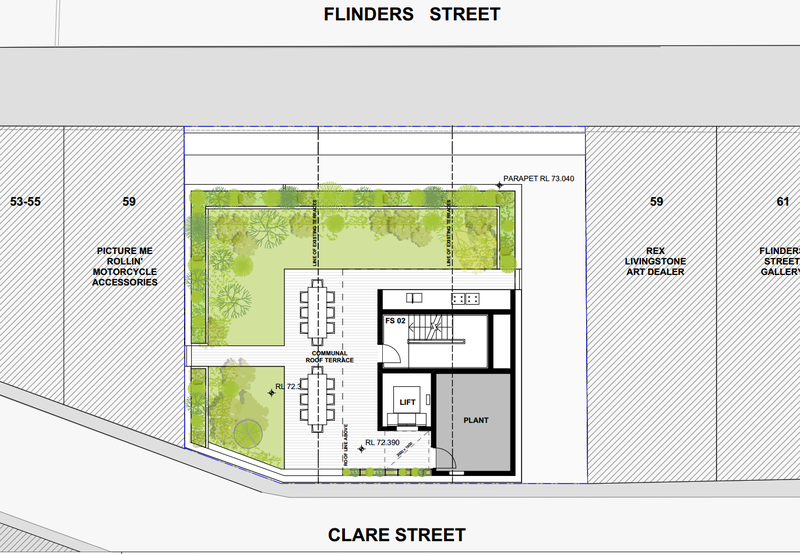 Source: City of SydneyIn addition, primary pedestrian access to the residential units is provided from Clare Street to promote laneway activation. Therefore the design of the proposal will be a sympathetic approach to address the heritage significance as well as the emerging nature of the locality. The proposed upper floor additions will provide transition between the high rise buildings at the rear of the site and the terrace group fronting Flinders Street. The proposed height and scale will also be compatible with other similar developments nearby. The building will maintain the existing setbacks at the ground and first floor levels to align with the exisiting development pattern. Level two to five will be further setback from the street and the southern boundary, to minimise bulk and maintain amenity for future occupants and to nearby properties. Roof terrace floor plan. Source: City of SydneyIn addition, the proposal is highly articulated and will utilise quality materials and treatments. The upper levels will incorporate balconies on the front elevation, while the rear elevation will incorporate window openings, louvers and planter boxes to provide additional relief and visual interest when viewed from Clare Street. The existing site contains 3 x two storey terrace dwellings. Each property maintains an active retail frontage at ground level with residential accomodation at first floor level. This DA proposes to maintain the existing 2 storey podium facade to Flinders St and insert an additional block of residential accomodation over 4 levels above. Additionally the proposal seeks to provide a communal green roof terrace for the use of the buildings residents. The provision of a variety of apartment types, sizes and orientations will facilitate a variety of household types. The proposal seeks to provide 1 studio apartment of between 35 sqm within the podium and 5 x 1 bed apartments of 53-63 sqm and 5 x 2 bed apartments of 75 - 84 sqm. This unit mix is consistent with market demand for the area and represents a wide range of apartment typology. Retail use at ground level can assist in creating a social focus for the development, and can assist in ‘anchoring” the residential component to its site, providing opportunities for casual interactions and meeting places.